In today's newspapers, I found many stories of how America's housing crisis is all-pervasive and worsening. As we move towards our Presidential election in November, that housing crisis, and our homelessness crisis, is going to be on people's minds. The "income inequality" issue, now front and center in the political debate, thanks to Bernie Sanders, is, among other things, a debate about affordable housing and homelessness. 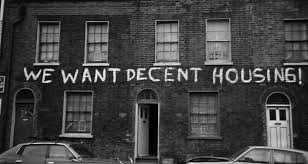 As "new money" is siphoned off by the super-rich, ordinary men and women are being driven into poverty - and out of their homes. Our next President needs to do something about it, and it will have to be dramatic, to be effective. Hillary Clinton was right, in her, acceptance speech at the Democratic National Convention, to say that we need to "follow the money." We need to track down "the money," as it pours into the bank accounts of the 1%, and then redirect that money from increasing the wealth of the already-wealthy to dealing with the critical problems of ordinary people, including our housing and homelessness crisis. Just in case this isn't obvious, that means that voters will need not only to elect Hillary Clinton President. They'll need to change the Congress, too! A column by David Brooks, of The New York Times, also appeared on the editorial pages of my local newspaper this Sunday. I'm not much of a Brooks' fan, and this column, typically, raised my ire. Under a title that proclaimed (in the online edition), "The Democrats win the summer," Brooks noted how the contrast between the Republican National Convention and the Democratic National Convention allowed the Democratic Party to take almost complete ownership of all the political high ground, from patriotism to compassion for the poor, to a "future to believe in." Yes, that is the Bernie Sanders' slogan, not the Hillary Clinton slogan ("Stronger Together"). As Brooks says, and correctly, "the Sanders people have 90 percent of the Democratic Party's passion, and 95 percent of the ideas." That observation by Brooks, being right on target, in my opinion, should make me happy, as someone who was an Alternate Delegate for Bernie Sanders at the Democratic National Convention. However, after providing this very justified tribute to Bernie Sanders and the "political revolution" he has called for, Brooks then spent the rest of his column essentially giving voters permission to vote for Donald Trump in November. The full title of Brooks' column, as it ran in the print version of the Santa Cruz Sentinel, was: "The Democrats win the summer - but may lose the fall." Both conventions featured one grieving parent after another. The fear of violent death is on everybody’s mind — from ISIS, cops, lone sociopaths. The essential contract of society — that if you behave responsibly things will work out — has been severed for many people. It could be that in this moment of fear, cynicism, anxiety and extreme pessimism, many voters may have decided that civility is a surrender to a rigged system, that optimism is the opiate of the idiots and that humility and gentleness are simply surrendering to the butchers of ISIS. If that’s the case then the throes of a completely new birth are upon us and Trump is a man from the future. I say that this kind of "analysis," in my opinion, is, in fact, a kind of "giving permission" to vote for Trump, because I don't think there is any question but that we are living in a "moment of fear, cynicism, anxiety and extreme pessimism." Brooks is right about that, but far too many people take "description" to be the equivalent of "prescription." In other words, if something "is," then that is the way is "has to be." That is a completely erroneous way to think about any "reality" we confront in a world that, in fact, we ourselves create. But Brooks doesn't follow his "analysis" by a statement that this is clearly a critical election coming up, because it is an opportunity to change this "moment," full of fear and anxiety, to a "moment" that has truly revolutionary possibilities to make the changes we need to make to establish a fairer, safer, and better world. Instead, at least the way I read his column, Brooks is basically suggesting that a vote for Trump is a to-be-expected and natural response to where we find ourselves today. That "gives permission" to vote for Trump, and that could well have catastrophic results, if enough people do it. Bernie Sanders supporters tried to make the point, right up to and into the Convention, that the mood of the country, as accurately described by Brooks, called for a candidate who was clearly on the side of change, of a "revolution" that could make things better, and who could not be characterized as a champion of the status quo. In my opinion, that is the vulnerability of Hillary Clinton as a candidate. She is light years ahead of Donald Trump, by any and every measure. She is on the high ground in every way, compared to Trump. But Hillary Clinton's ability to win the election depends upon the voters believing that she is a force for change. The status quo is not acceptable, and if the Democratic Party candidate is not seen as someone who will lead a movement to change the current reality, then the other alternative, however repugnant it may be, will be attractive to the voters. Hillary's speech was terrific. She needs to keep talking about the kind of changes that she highlighted in Philadelphia. If she doesn't, there is a good chance that Hillary will have a kind of "Herbert Hoover" candidacy. Hoover was one of the best-prepared and decent Presidents we ever had, but one who could not react, properly, to the extraordinary times in which he came to the office. These are extraordinary times. And Trump is no FDR. Hillary has to be! I am hoping that Hillary can now take the passion and ideas of the Sanders' campaign, and bring them to the American people between now and November. The stakes are pretty high!